Under Site Setup, you may define external services for which you have a license to use in your course site. Currently, integration throughout Etudes is only available for VoiceThread. For single sign-on to publisher content, please see Adding Site Links to Publishers. The below process will enable VoiceThread in the Etudes content editor. This allow you to link or embed VoiceThreads when authoring (i.e. Syllabus, Announcements, Modules, Assignments, Tests, Surveys, and Discussions). You and your students will be able to create and participate in VoiceThreads without having to log into VoiceThread. To enable VoiceThread, you will need a launch URL, a launch key and secret from your VoiceThread representative. Once you have the above data, follow the below instructions to enter it in your Etudes site. Click on Edit to the right of External Services. A window will open where you can add your details. Under the Title, enter: Voicethread editor (case sensitive. Must be entered as listed!) and the Launch URL provided to you by your VT representative. Click on the LTI icon (to the right of the URL), and include the launch key and launch secret provided to you by your VT contact. Click on Done to close the details window. Click on Done to close the external services window. Once you have completed the above, the “VT” icon in the editor throughout Etudes when authoring content. You can then embed VoiceThreads following the steps provided in the next section of this tutorial. To embed a Voice Thread in your content, follow these steps. Click on the VT icon in the editor. Find the VoiceThread you want to use, and drag it into your Course Group on the left side of the page. This is what gives your students permission to see it. Once you’ve shared in step #3 above, click on a VoiceThread to select it. Click on the menu icon in the top-left corner of the VoiceThread. Click “Copy Embed Code”. This will copy the code to your clipboard. Place your cursor in the box at the top of the window that reads “Copy link address here”. Paste (Ctrl + V or command + V) the embed code into that box. You will see your VoiceThread embedding on the page. It will appear as a box with the word “iframe”. Save your work by clicking Save or Done (as appropriate) at the bottom of your Etudes page. If you switch to the student view or preview, you will be able to play the Voice Thread. Click on Site Setup in the left menu. Enter a Link Title (for example: “VoiceThread”). Enter the Launch URL (provided by VoiceThread). Click on the LTI icon to the right of the URL. Enter the Launch Key (provided by VoiceThread). Enter the Launch Secret (provided by VoiceThread). If you prefer to add a link to a specific Voice Thread within your content, as opposed to embedding it, follow these steps. Click “Get a link” at the bottom of the window. This will copy the code to your clipboard. Paste (Ctrl + V or command + V) the share link into that box. You will see your link in your content. Note: If you don’t see these options in your course, that probably means that the integration was done after your course shell was created. 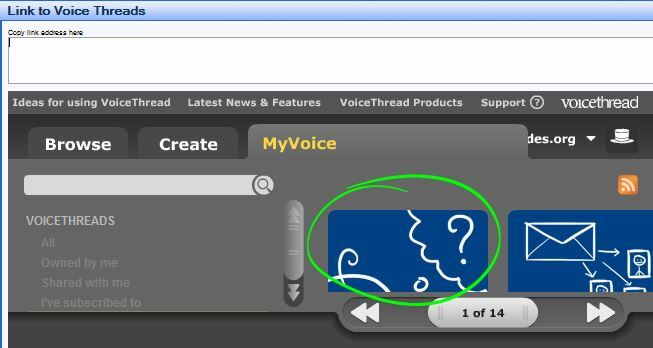 In that case, please refer to the instructions at the top of this page on how to enable VoiceThread in your course site’s editor before following the instructions above. If you have entered the Consumer Key and Shared Secret into your course yourself, please verify that these are accurate. If you did not enter that information yourself, have your Etudes administrator check to make sure the Shared Secret and Consumer Key are entered correctly, and that the clock on your Etudes server is accurate. You’re not automatically signed in to VoiceThread when you click on a VT link. When you click on a VT link, you see a page titled “Verify Your Account”. Check to make sure the Shared Secret is entered correctly. If the Shared Secret is accurate, please make sure the clock on your Etudes server is accurate.